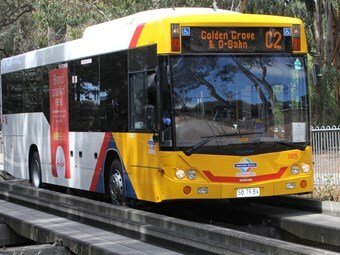 A new Park’n’Ride facility for Adelaide’s noted O-Bahn Busway opened today. The new South Australia Tea Tree Plaza Interchange Park’n’Ride, offers commuters direct access to the interchange and provides high quality passenger facilities. The car park can be accessed directly from Smart Road, via the O-Bahn Busway access road. This road has been upgraded to cater for both bus and car vehicle traffic. The new Tea Tree Plaza Interchange Park’n’Ride features 700 car parking spaces, Full CCTV coverage of car park and security staff each weekday evening. Parking is only $2 per day for metrocard holders who have travelled on public transport within two hours of exiting the car park and $2 or more on their metrocard. Casual and non-commuter parking is available for a fee of $10 per day. This fee also applies to commuters who do not meet the conditions outlined above.